In the coming months I will be traveling quite a bit. Check in for stories and photos from my adventures! Vince and I have had quite the year. Since we have been home and running into people we have been getting a lot of the same questions about our trip. I figured this would be a great time to reminisce over our year as well as answer the most common questions about our favorite things during our time abroad. Many of your remember this island from the blog I wrote about it, and several people have commented about the video I posted of me dancing and how happy I looked when we were there. That’s because I was happy! Just being able to be that care free and let myself fall into rhythm with the music and enjoy the people around me made me the happiest girl in the world. Both of us were right at home living the slow island life. This place is unlike anywhere else we have been and we would (and will) go back in a heartbeat. The people are unbeatable, the way of life is simple and easy, and the scenery is exquisite. To read my previous blog about Bastimentos, scroll to the bottom of this page. From the get go we should have known that this place was going to be spectacular. It boasts the impressive credentials of 'National Park' and 'UNESCO World Heritage Sight', which are sure signs that this place would leave an impression on us. We loved much of Italy but unlike the business and bustle of its other cities, Cinque Terre in the off-season is heaven on Earth. It is becoming more touristy but still remains a hidden gem in Italy. Its hilly terrain and colorful buildings are right off of a picture perfect postcard. The best pestos in the world, paired with homemade pasta, melt in your mouth cheeses, fresh seafood, and Italian wine is reason enough to visit this small town. No cars will be found on the streets here. The train is the only way in and out of this small fishing village nestled on top of jutting cliffs over looking the Mediterranean. The authentic Italian vibe you feel from walking down these hilly streets in unparalleled to anywhere else we have visited in Italy. Another small town pops up on our list of favorites- only to prove that the best places are those that are somewhat hidden and hard to reach. Bruges is a quiet and quaint town, similar in size to Forest Park. We often describe it as a fairytale land because it was so magical in that sense. The weaving canals, ivy crawling up the buildings, cyclists riding by, and church bells ringing give this small town a homey, relaxed feel. Strolling through the city with a Belgium beer in one hand and a Belgium waffle in the other (just kidding you could never eat a Belgium waffle with only one hand) was a daily activity for us until the town quietly shut down around 7pm every night. In the evening it was easy to find pubs and make friends because people trickled outside of the pubs along the street, smoking and drinking. You could hear the warm chatter as you passed by or were called in to join the crowd. There are only a few countries where we spent time in several cities and felt like we got a good taste of the entire country. Of those few we found Spain to be our favorite overall. We were there for long enough that I have so much to say I am going to make a separate blog post just about Spain. I honestly think the reason we liked it so much is because we had several really amazing experiences there. A lot of our ‘favorites’ have to do with food or people or culture or beauty but Spain was a really fun place for us because of the events. La Tomatina (the largest tomato fight in the world) was so fun and unique. Getting to see Cristiano Ronaldo play from the 4th row in Madrid was wild. I have never had so much fun at a sporting event in all of my life. Barcelona was great because we had our engagement photos taken there and made a new friend in the process. We also got to meet up with some friends from home and have dinner together which was a highlight. Plus, we lived next to La Rambla and just feet away from the market, so we had unbeatable access to some of the best yet cheapest food, and something was always happening on the main street out in front of us, no matter what time of day. In San Sebastian we became close with some Aussies that we had spent days on a bus with, and enjoyed a beach day and night out together. Since we spent so long in Spain it was really nice to get to know our way around a city and feel a bit more comfortable there. Another plus about our time in Spain was that it was easy to communicate. While I always started off speaking in Spanish, if I was having trouble someone would easily be able to help me since so many people spoke English there. It took off some pressure and made going places more enjoyable. Oh, my, gosh. My mouth waters just thinking about Peruvian cuisine! Lima is home to the best chef in the world, and the number 5 restaurant in the world. 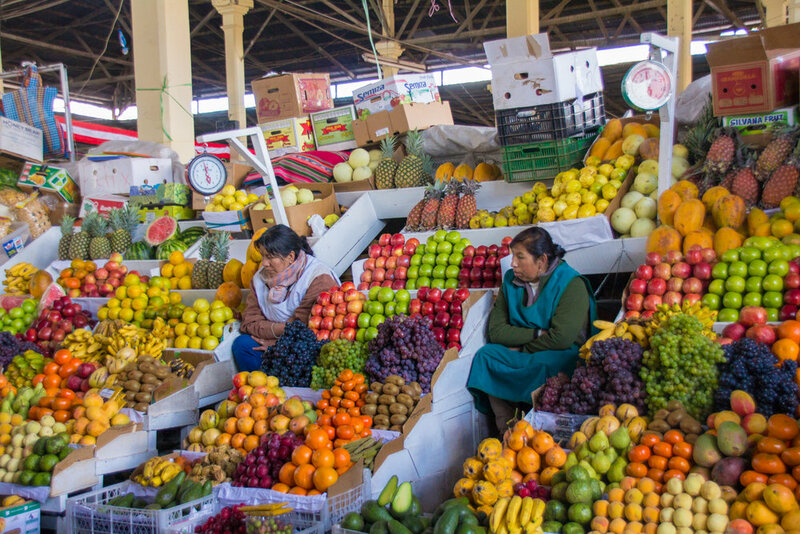 From sophisticated chefs to the women cooking on the corner, Peru’s food culture is unbeatable. Gastronomy is a huge part of Peruvian culture and it shows even as you walk down the street. On every corner and bus terminal there is a woman cooking marinated meat skewers (anticuchos), potatoes and huancaína sauce, someone selling all kinds of pastries and cakes, little girls walking around with churros to sell, ice cream push carts, fruit and veggie stands, snack and drink stands, all kinds of nuts, and hard boiled quail eggs (huevos de codorniz) that those women peel impossibly fast. Of course we can’t forget about the impeccable ceviche, salty salchipapas, Peruvian staple Inca Cola, traditional pisco sour or my personal favorite, chicha morada. Peru is one place you will never go hungry and it is not unusual to see people stuffing their face as they walk down the street. With all of these great things that I have to say about Peruvian food- the best part is that it is stupid cheap. All of the street food I just listed costs between 1-3 soles. That equates to $0.30 - $0.90! For breakfast every morning we would walk down the street and get a nice sit down meal with bread, rice, steak, eggs, tea, and veggies for a just over a dollar. You just can’t beat that. To read more about Peru and their cuisine, visit my previously written blogs on Peru, here. Barcelona is significantly more expensive than Peruvian food, but you could still find a bargain if you knew where to look. We ate paella galore and would stuff our bellies full of tapas and sangria then practically roll around the city instead of walking. As I mentioned earlier, we lived right next to a market, which probably had a great influence on our Spanish food experience. We could never decide what to eat because everything we tasted was so delicious that we wanted to eat it again, but also wanted to try new things. Some of our favorites included paella (of course) jamon iberico, any type of seafood we tried (the oysters were mouthwatering) and patatas bravas. A selection of tapas. The patatas bravas are the potatoes covered in hotsauce at the bottom. From the wildlife, to sunsets, to waterfalls and beaches I was constantly in awe. I think the photos can speak for themselves on this one! People were unbelievably warm, welcoming, and helpful in Central America. Even when I had trouble communicating they would be patient and help as best as they could. You talked to the people you passed by on the street and we always felt like we were a part of a community that looked out for one another. There is a perception that Amsterdam is all about pot and prostitutes. While that of course is some of the culture and history of Amsterdam, there is so much more to learn from this city than just going there to party. I will be writing a post that goes into much more detail about Amsterdam because we found it so interesting, but some of the highlights are: the dancing houses, its rich history as a port city and the birth place of the stock exchange, The Anne Frank House and stories of WW2, how a city can be built below sea level, the decisions that lead to it being known as the most liberal city in the world, and hilarious facts surrounding the bikes and the hundreds of thousands of cyclists of Amsterdam. Out of everywhere we went, we thought it also had the coolest museums and most unique things to do. We could have kept ourselves busy for weeks with all that there is to do in Amsterdam! 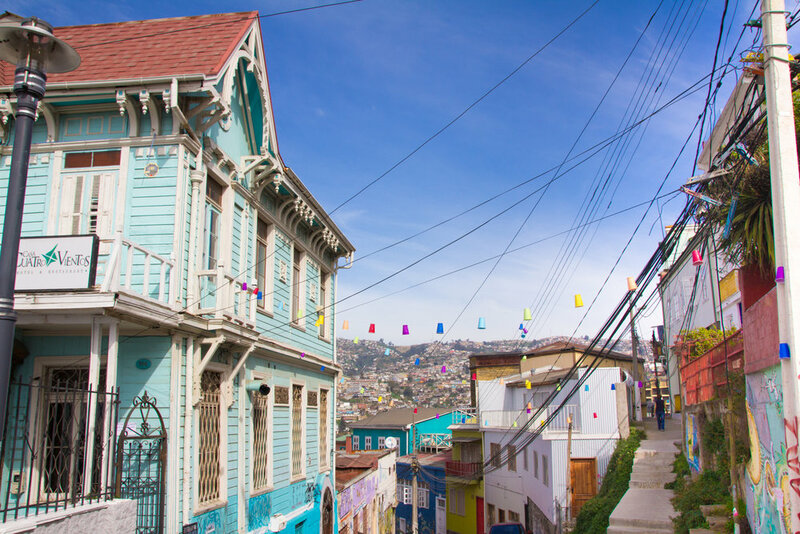 Valparaiso is an artsy city with a laidback community. Its transportation is reliable and there are all of the modern amenities we would want. You may be wondering why we wouldn’t live in the places we listed as our favorites- some of those places were such small towns that it would be hard for us to live there and find places to work. We also prefer some modern comforts you would not find in those places, like running water year round, big grocery stores, and air conditioning. While mastering the language would no doubt be challenging, we found the people to be very eager to speak English whenever they could and excited to meet Americans. Everyone was very friendly and patient with us and we felt very safe here. Learn more about Chile and Valparaiso in a previous blog post '10 Things you Might Not Know About Chile', here. The thing we loved about London was the diversity. That was the biggest thing we were drawn to here, but like Amsterdam there is an endless amount of unique things to do in the city. 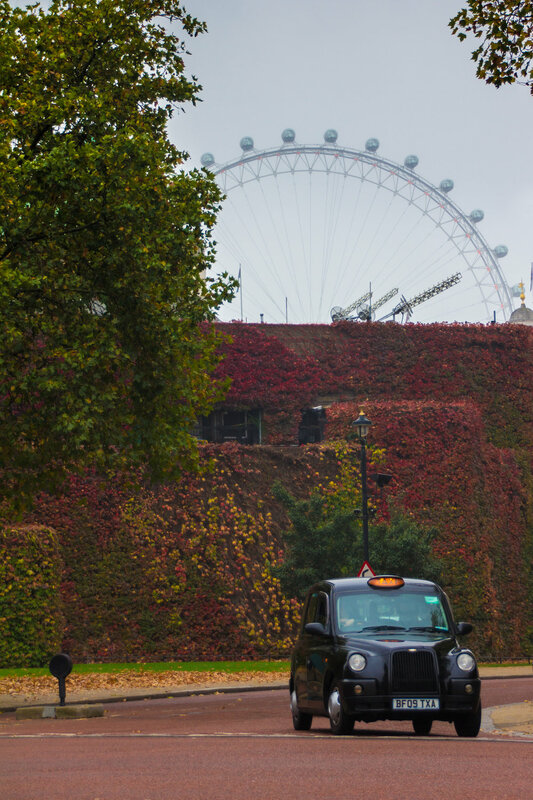 All types of different neighborhoods, good food from all over the world, weekend markets, minimal language barrier and the big entertainment scene made it easy for us to fit into life in London. The only thing we didn’t care for so much is the weather, but hey- you can’t have it all! I started to write down all of my favorite memories of the trip, and realized I had already typed 5 pages worth of favorite things. Obviously I had to rein it in, but it is so hard to narrow down the most important moments of the last 8 months. I've deleted and rewritten paragraphs over and over because I couldn't decide what moments deserved a feature. Sometimes it is the smallest things that you witness that changes the entire way you view life, and trying to put that feeling into words is not easy- in fact it is nearly impossible. Some things you just have to experience on your own to be able to relate to, but below I have tried to pour meaning into these words so that you can start to get a glimpse of the wonderful journey we went through. Zapatilla Island is an uninhabited island of solely jungle and white sands. 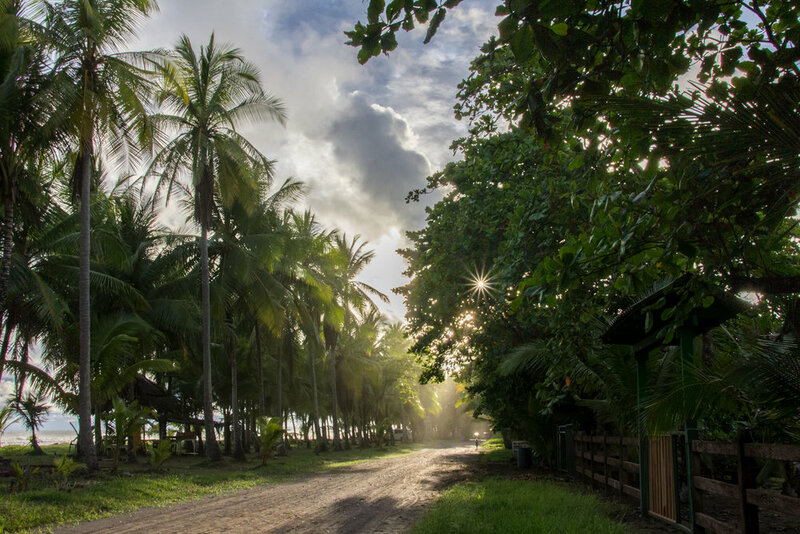 It is hard to reach because of the coral reefs and lack of a boat dock, but the beauty is worth the journey. On the way there we picked up some lobster from a fisherman in the middle of the ocean. Our friend dug a sand pit, started a fire, and cooked a meal for us on the island. We ate fresh-as-fresh-can-get lobster on leaves picked from a tree. As Vince and I walked hand in hand in the powdery sand, fresh lobster on our lips and sea breeze in our hair, I couldn’t think of a more perfect day. Machu Picchu is one of the Seven Wonders of the World for a reason. Being on top of a sacred mountain, looking around to see a river below us, and lush jungle climbing the sides of the Andes is a spectacular feeling in and of itself. Walking through ruins that are a miraculous part of history had me living life on a high note already. Just being there was a memorable and awe inspiring experience of its own. Then to have the love of my life ask me to be his wife sent my emotions into a whirlwind. My head was spinning, and my hands were shaking and I couldn’t contain myself. When Vincent got down on one knee, that place become much more than a Seven Wonder of the World to me. It’s now part of a memory of one of the best days of my life. Read more about Peru and the magic of Machu Picchu here. We hiked to this waterfall with our friends, which was a huge accomplishment in itself, because it was such a strenuous hike. Once we got there I was the only one who wanted get in the water, but I wasn’t about to leave without swimming under the waterfall. Feeling the power of the waterfall pound on my exhausted body while I swam alone in this deep natural pool made me feel strong and empowered. That night we returned to the hostel, laid in hammocks and talked about life while David strummed on his guitar. Vince and I rose in the morning to the sounds of howler monkeys. The monkeys put off a sound that is a deep roaring siren and is almost devilish. It sent chills running down our backs as the sound echoed through the jungle. We walked down to the rocky beach and climbed all over the black bulges listening to the more pleasant noise of waves crashing on the rocks while the sun rose. More about Montezuma here. In Costa Rica we visited hotsprings that sat at the base of the volcano they were heated by. We arrived and found the steaming place all to ourselves. We slipped into the smooth, hot water, sipped on a drink called "Pura Vida", and stared into the clouds. We were throughly wrinkled and relaxed, when all of a sudden, the heavens opened up and it began to rain. The sensation of the cool rain pattering on our skin while slinking along in the hot spring was so strange it made us giddy. This is a time I sat back, just looked at the beauty all around me and was completely overwhelmed. Looking up at the stars, I had never seen a clearer sky in all of my life. I was laying there on the dock under my loves arms, almost becoming one with the ocean as our bodies flowed in time to the soft waves that were hitting the dock inches below us. To our left was a bonfire with friends gathered around, laughing and telling stories, and out to the front in the bay were girls squealing as they leaped off of the sailboat into the warm ocean. I can still hear the sounds of that night, feel the soft rocking of the dock, and see the glow of the fire and the sparkle of the sky. I just remember being so at peace with everything in life in that moment and being so incredibly grateful to be experiencing this. This year and this trip has been better than I could have ever imagined. It exceeded every expectation I had. It has showed us that we are capable of doing intimidating and difficult things on our own, explore roads that no one has gone down before, and save money with fierce determination. I now know that I can live and work together with Vincent 24/7 and not only get along-but grow closer together. We dedicated tons of time and effort to planning this and it really paid off. This trip has allowed us to see how other people in the world live, which in turn humbled us incredibly. We met some of the kindest souls on the planet and made friends that we will keep for life. We learned that material things matter so little, and experiences and relationships are what this life is all about. My heart is overflowing with gratitude and even as I write this, tears swell in my eyes as I recall all of the events of these past 365 days. This year and all that it encompassed has been nothing short of life-changing. You have everything planned and booked for your vacation, but now you need to decide exactly WHAT you’re going to do when you get there! The thought can be somewhat overwhelming so I made a quick list of how to fill your time to the best of your liking. Look at reviews to see the best ones in the area; sometimes there are really unique things to see even for people who aren’t big into museums. I’m not huge on museums but we do look for children’s and interactive museums because they generally are really fun! This museum in San Jose, Costa Rica used to be a prison. It has been remade into an art gallery and children's museum and is free to enter! If you like landscapes and pretty views: Try to look up the highest point in the city and see if there is a way you can easily access it. This always makes for breathtaking views and awesome photos. You can also just look where you are on Google maps and anywhere you see the camera symbol, it’s a good bet that you will want to visit there. Sometimes you have to think outside the box and ride the elevator to the top floor of a mall. El Corte Ingles Malls usually have a (gourmet) food court at the top with windows, so we hit those up for free skyline views. Barcelona from Montjuic where most people go to see the castle. However, if you know you are going up high above the city it's a good idea to search for an outlook somewhere! We just stumbled upon this view. Rode a mall elevator to the 9th floor to get this view of Madrid. The small price we paid to ride this tram was well worth the beautiful view we got of Santiago, Chile and The Andes mountains! If you’re a foodie: The world is a playground for these types of people, each place opens up a new experience and new opportunity because the food culture can change so much from one place to another. Some places known for great food are: Peru, Italy, France, China, Greece, Vietnam, Mexico, Thailand, India and Spain. If you walk around neighborhoods and see the Trip Advisor logo on the door those places are usually great. Of course the best bet is probably to ask the locals! You can also check out food experiences, pricey but memorable. Another great thing are food tours, which allow you to sample many typical items in a short time for a flat price. Markets are another favorite of mine, because they’re often cheap, always delicious, and fresh! Some of these foodie experiences can even be booked on Airbnb now if you are in a major city! A food tour we took in Peru allowed us to try many traditional Peruvian dishes like alpaca, Huancaina sauce and potatoes, many variations of pisco, and this amazing ceviche (pictured). If you like architecture: Look for old churches, old neighborhoods, and anything that says “plaza….” Buildings of importance are almost always surrounding the plazas. Another key word to look for is “antiguo” (think of the work antique) and you will usually find some original architecture in those areas. Europe, being old as it is, has many different styles of intricate architecture you are sure to appreciate. If you are looking for something newer many of the booming cities in Asia and the Middle East (and even the US) have new, stunning architecture. 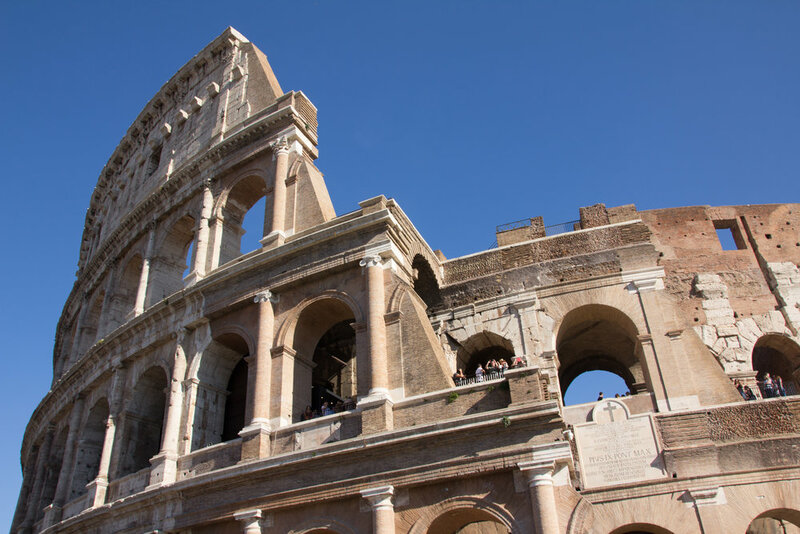 Of course some of the 7 Wonders of the World are the greatest architectural feats known to man so you will want to check out places like the Coliseum, the Pyramids and Machu Picchu. You can find a list of the 20 best cities for architecture lovers here. Some of my favorite architecture has been found in Barcelona and various cities in Italy. Pictured above is the Cathedral of Barcelona. Park Guell, crafted by the famous Antonio Guadi. If you like art: Art galleries and art museums are always fun to visit and easy to find on the map. A better thing to do is ask around, locals can usually point you in the direction of a local gallery or shop that is maybe more unique than the large tourist attraction that everyone comes to see. Another thing to ask around for is street art. Murals and graffiti often make their way onto buildings no matter what city you are in. Finding the best spots may take some wandering around, but that’s just part of the fun! 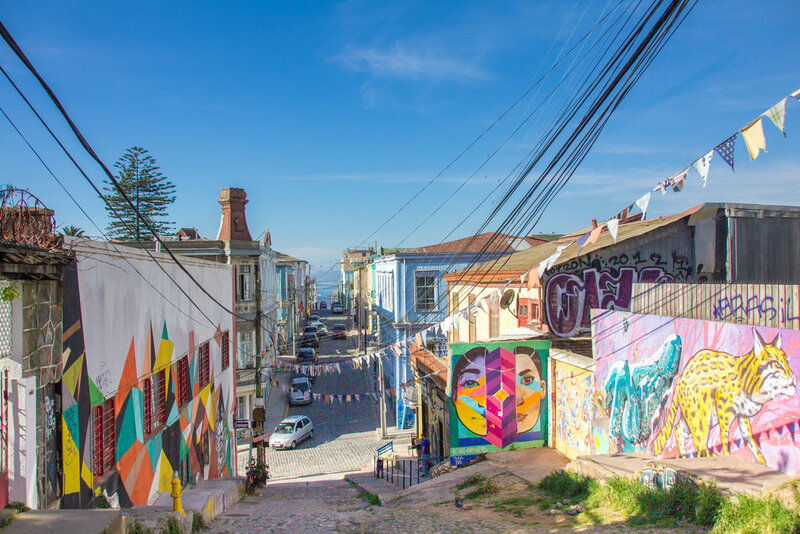 Valparaiso, Chile was the most fantastic place to find street art. They are so well known for it that they had souvenirs with various murals from the streets printed on them. This is the most famous mural we have seen, an original work by Keith Haring done on the streets of Barcelona in 1989. If this type of "street art" is more your style, you can find artists in any major city wanting to draw your portrait or caricature! If you have children: This is one of those things that may take more research, preplanning and looking at reviews because you want to make sure the place has plenty of kid friendly activities along with things that are enjoyable for you. In general things to look into: children or interactive museums, parks, Hard Rock Cafes or unique dining experiences- places you can watch the chef cook are awesome. Light shows or dancing fountains are popular in many locations. Souvenir shops can be turned into an activity if you give your kids a budget and let them pick what they want. Beaches and local fairs are usually a hit, water parks or amusement parks are fun, and street performers always awe! Just be sure to take some change with you if you go searching for this type of fun. If you can get the kids (and yourself) up early in the morning to avoid crowds and heat it can be a more enjoyable experience. This is great because you won’t be so worried about them getting lost, many places have free visiting hours early in the AM, plus kids may not wear out as quickly as they would in mid-day heat. This also allows for a picnic in the shade or lunch indoors and nap afterwards, during the hottest part of the day. Then you have time to relax in the evening and get ready for the next morning without having to stay up too late. This is actually the schedule Vincent and I like to follow too, although we can hardly ever get to bed early. As one last reminder, always look for kid's discounts or free activities online. Facebook, Trip Advisor, and Lonely Planet will be really helpful for this type of traveler. Playing in these misty fountains was way more fun than any pool I've been to! A unique transportation experience could be a fun activity, this one comes with beautiful view! Bonus points because you don't have to walk up a huge hill, too. These breakdancing street performers were amazing to watch! See if there are any events in the area while you are there. We got to attend this Peruvian parade and it was one of the funnest things we have done yet! And, if all else fails, there is always a plethora of kids chasing pigeons in the main squares. If you like tours: Sometimes you don’t want to do all the research and the planning, sometimes it’s too difficult to figure out everything especially if all the websites are in a different language, sometimes you only have one day to squeeze everything in, sometimes you feel safer going with a group- whatever your reason is, tours can be a great way to see all the highlights and learn about them along the way. Many cities offer free walking tours- just remember a tip is expected at the end. I’ve also seen a ton of big double decker buses that offer a tour of the city from the comfort of your seat. The company is called ”City Sightseeing” and they are in just about every major city I have visited. If these options are too structured for you but you still want to be knowledgeable about the things you are visiting, look into audio guides. Most major attractions offer them for cheap or even free! More than likely you will be inundated with tour company offers and people on the street handing you brochures so it IS best to do a quick internet search before hand just to be sure you are going with a reputable company and getting the best bang for your buck. 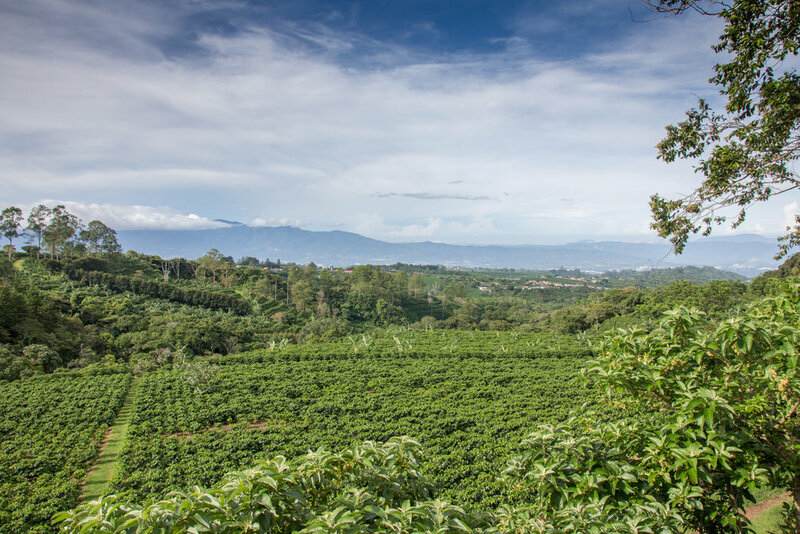 We did a tour in Costa Rica of a coffee farm! If you like the outdoors: If you just want to be outside one of the best things you can do is walk and explore the city on your own. You never know what you will stumble upon. We do this more often than anything else because we enjoy getting a bit lost and finding new things. Sometimes the best days are when we have nothing planned but to wake up and walk out the door. Just be sure to ask someone about any sketchy neighborhoods to avoid before leaving, and try to keep a mental note of your whereabouts so you don’t accidently find yourself in an unsafe area. Parks are also a great area to chill out and enjoy the outdoors. They’re easily found on the Internet or Google maps. You can also look into outdoor activites based on where you are. Things like: hiking, skiing, snorkeling, paddle boarding, boating, and fishing come to mind. This hike was more challenging than we anticipated but the waterfall at the end was well worth it! Got to cross that off my bucket list! Photo taken by my dear friend, David. Horseback riding can be a bit pricey but there are ways to make it cheaper: Groupon, student cards, and coupon clipping all come in handy. Our friends getting ready to body board! If you like shopping: I will always advocate to support local artisans instead of things made in huge factories by exploited workers. The best places to find hand made goods is in local markets, at artisan fairs, on boardwalks, or in the more touristy areas where you will find the boutiques and people setting up booths on the street. This is something you usually have to ask around for, but most markets if they aren’t every day, function on Saturdays, Sundays, and sometimes Wednesdays. We go to many different markets, whenever we pass one on the street we always stop by! You'll always find something interesting at the food markets! This Peruvian market in Cusco was my favorite. If you’re a budget traveler: If you are under 30 or a student there is a discount card that will save you a ton of money on museums and other activities. We found this especially helpful in Europe, not as much in Latin America but we did get half off our trip to Machu Picchu, and they always have lots of restaurant discounts if you like to eat out. It is called an ISIC card and it is the ONLY student discount card accepted all over the world. More than likely, your actual student ID will get you nowhere; it MUST be this type of card. They also have cards for people who aren’t students but under a certain age (30). You can find out how to apply for it and how it works here. It does initially cost, but we have easily saved hundreds of dollars because of it. If you are not eligible for the card there are other ways to make your money stretch. I have never used it personally, but I hear that Groupon sometimes has some great offers. Also, many museums and tourist attractions have free visiting times or free days you can go. It may not be widely advertised so you may have to do some digging, or be willing to get up early, but it’s worth it. In Barcelona we woke up at 5am to get to Park Guell in the morning time when it was free. We got to see the sun rise over the city with almost no one there and it was so peaceful. One thing that really has helped us is when we find a place we want to make sure we visit, we type it into Google maps on my phone and save it under "want to go". I "favorite" the things I want to do most, and "star" anything important like where we are staying or the bus station we need to go to. It’s a very nice visual and super easy to see what you should hit in the same day based on what is close to each other. As you zoom in on the map, you are able to see the names of everything. To save a place, type it in the search bar and click on it. This screen will pop up with a description. Just click on the save button! These are your labeling options for any saved location. You can choose more than one or create your own as well! No matter what type of traveler you are there are usually plenty of options for everyone to enjoy! I hope you have new ideas of fun things that will suit your fancy when you go on your next trip. If you have any other ideas or are a different type of traveler looking for advice let me know in the comments. Keep updated on all my adventures by getting every blog post sent straight to your email! We respect your privacy and will never send you junk mail or give away your information.